Fans of “Simon vs. the Homo Sapiens Agenda” — the beloved 2015 young adult novel by Becky Albertalli — can relax and celebrate. 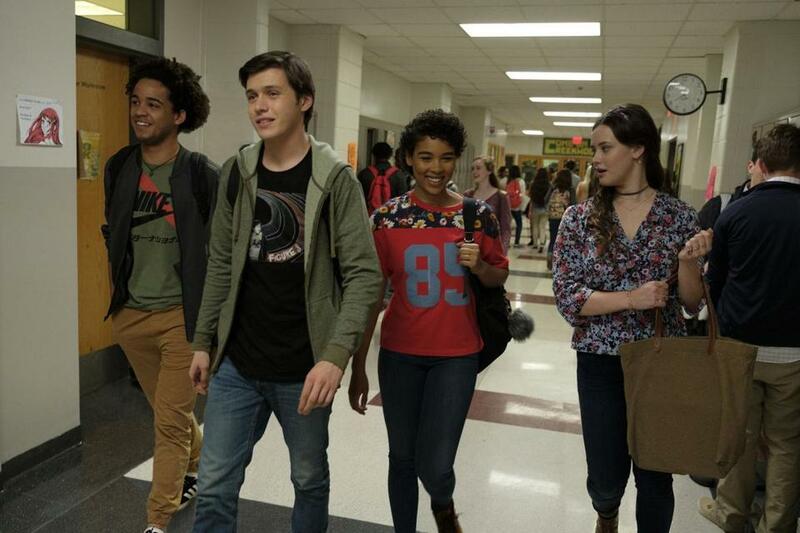 “Love, Simon,” the film adaptation of the book, is great. It’s not exactly like the novel, but it captures the best parts of it. Those who haven’t read the book should know that “Love, Simon” is a sweet, modern romantic comedy that manages to channel the teen movie classics of the late John Hughes, but only the good stuff. It’s also a deeply empathetic story about a teenager who’s forced to come out to a community of loved ones. Part of the success of the film can be credited to Nick Robinson, who is perfect as Simon, a well-liked high school senior who’s gay and doesn’t know how — or when — to share. After reading a revealing post on a school gossip blog, Simon begins a secret correspondence with another gay student at school. He falls in love with him, even though the identity of the object of his affection is a mystery. As the notes progress, Simon finds himself wondering “Is it you?” about every adorable boy he interacts with at school. His hopes are played out in imaginative, swoony fantasy sequences. The film finds tension when Simon’s e-mails are discovered by Martin, an obnoxious kid at school, who’s infatuated with Simon’s close friend Abby (Alexandra Shipp). With the notes in his possession as screen shots on his phone, Martin blackmails Simon into helping him impress Abby. The plots of love and deceit get pretty Shakespearean, for better and worse. Robinson, who was your basic, one-note heartthrob in last year’s YA adaptation “Everything, Everything,” shows range as the hero of “Love, Simon.” Every wild emotion plays out on his face, and the audience is forced to cringe and celebrate right along with him. In an early screening of the film, teenagers and adults were spotted covering their eyes, laughing, and lip-biting. There was also giggling and crying. The actor is aided by screenwriters (Isaac Aptaker and Elizabeth Berger, of “This Is Us”) who don’t patronize their audience; a director, Greg Berlanti, who understands the look and feel of good teen stories (he’s an executive producer on the CW’s “Supergirl” and “Riverdale”); and a supporting cast that includes Jorge Lendeborg Jr. as Simon’s cool-yet-vulnerable friend Nick; Katherine Langford, of “13 Reasons Why,” as Simon’s platonic life partner Leah; and Shipp, who’s a standout as the new girl navigating a group of friends who have known each other forever. Clark Moore also steals scenes as a student who’s already told everyone he’s gay. As a coming out story, “Love, Simon” might seem too shiny at times, but that’s part of the point. Simon is a white teen who lives in a big house, wears adorable jean jackets, and has a supportive and diverse group of friends. His parents are almost perfect; his mom is a mental health professional (Jennifer Garner) who’s ready to talk about monumental things, without judgment, at any moment. But even for Simon — who seemingly has everything — the decision to come out is monumental. Life-altering. Sometimes devastating. Even with accepting parents and friends, Simon is confronted by a list of heteronormative statements before he’s finished with breakfast. The audience is forced to ask how it would all go down if Simon didn’t have everything. That point isn’t forgotten; the question is implied throughout the story. The wealth in “Love, Simon” can also get distracting at times (the carnival at Simon’s school is like the one at the end of “Grease” . . . times 1,000). But at its heart, “Simon” is a romantic comedy, and those stories often go big. Apartments in rom-coms are usually too well-designed to be real; proclamations of love sometimes end in over-the-top proposals and inconceivable flash mobs. It’s part of the cinematic experience of being magically smitten, which, by the end of the film, is all we want for Simon — and maybe for ourselves, too. Directed by Greg Berlanti. Written by Elizabeth Berger and Isaac Aptaker, based on a novel by Becky Albertalli. Starring Nick Robinson, Katherine Langford, Alexandra Shipp, Jennifer Garner, Josh Duhamel. At multiplexes in Boston and suburbs. 96 minutes. PG-13 (thematic elements, sexual references).